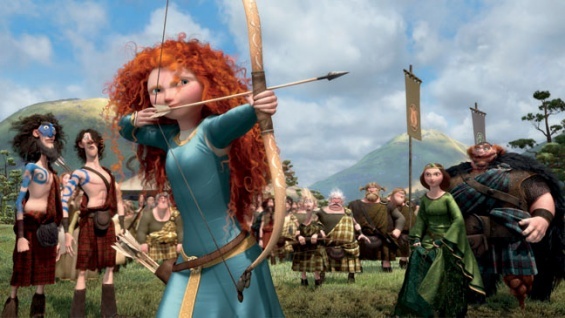 It may seem a bit premature—not to mention unfair to Pixar’s salute to archery-loving gingers—to open a review of Brave by wondering if this is the beginning of the end for Pixar’s streak of crazy-good. After a rebellious display of archery that suggests Merida would be better off taking her talents to South Nottingham, princess and queen have a particularly spirited mother-daughter chat in which hurtful things are said, tapestries torn and bows thrown into fire. One anguished ride from the castle later, Merida stumbles upon a witch’s cottage. Apparently, witches in Ye Olde Scotland had a nicer reputation than elsewhere, since Merida eagerly makes a deal so vaguely worded even the gullible Snow White would have asked a few additional questions. While what happens next does, technically, make her relationship with her mother less unbearable than before, it also provides the impetus for Brave’s remaining action. There’s more, of course. There’s a monster bear who logs enough screen time to cause lasting regret for any parent who brings a nightmare-prone child to the theater. There’s Merida’s mischievous triplet brothers, toddler versions of the Weasley twins (plus one). And there’s the gorgeous vision of Scotland itself, a rich palette of greens, oranges and blues that makes a compelling argument for catching the film on the big screen. But above all else, Brave is a film about mothers and daughters, and this is one of its strengths. The plots of Pixar’s best films possess emotional cores fueled by some of life’s most formative bonds. In Finding Nemo, it’s the relationship between father and son. In The Incredibles, it’s the family, en toto (husband-wife, brother-sister, parent-child). Toy Story 2 is both an ode to the bond between child and toy as well as the affection we, as adults, feel for our own childhoods. (Up knocks out the husband-wife dynamic in the opening montage before throwing in a grandparent-grandchild dynamic as a freebie.) Brave taps into that potentially most explosive of familial bonds—the complicated relationship between a mother and her teenage daughter. Given how the fairy tales most mined by Disney are littered with deceased mothers and homicidal step-mothers, it’s not surprising Pixar had to make up its own fairy tale to find a working mother-daughter tandem. It’s also immensely welcome. Then there’s the Witch, the type of supporting character Pixar routinely knocks out of the park—think Edna Mode or Doug the dog—seems yoked to the same advance-the-plot-then-buh-bye role as Mor’du. Perhaps much of this can be attributed to a mid-production change at the helm—Mark Andrews took over for Brenda Chapman with about 18 months to go. Maybe that explains the sloppier moments, both major (ignoring the fact that one-third of a room is staring in the direction of a rather conspicuous character trying to sneak upstairs unseen) and minor (the unnecessary foreshadowing that a stone might just crack … later). Whether Andrews introduced such flaws himself, or they represent the remaining cracks in a masterfully salvaged initial effort (“You should have seen it before I came aboard!”), these uncharacteristic false notes bring us back to the question we started to ask at the beginning—is it fair to wonder about the state of the art at Pixar? The answer is “yes,” for several reasons. And finally, there’s Brave, a Pixar film with flaws that one does not expect in a Pixar effort devoid of talking automobiles. A film that, like Young Macintosh (who goes second in the archery contest), is pleasing to the eye, has an adoring fan base and fires a shot that is nonetheless slightly off the mark.